The Wall-Mount Outdoor White LED Decorative Light from Lithonia Lighting includes integrated LEDs, so no bulbs are required. The modern design is ideal for applications where extra style is needed. Corrosion-resistant design provides style to your outdoor lighting. The sensor pivots for mounting to an eave or wall, while the universal mounting bracket makes installation fast and easy. The durable polycarbonate housing is available in white or bronze finish. 180 degree motion detection zone. When you answer the alert, you can see, hear and speak to people on your property from anywhere. Hear and speak to people with 2-way talk. Customize your motion zones to focus on important areas. Get on-demand video and audio with live view. Floodlight Cam. If you catch a suspicious person on your property, sound the 110-decibel alarm to scare them away. Customizable motion zones. Customize Your Motion Zones. Focus on the most important areas of your yard, and get instant alerts when motion is detected. LED 10W Outdoor flood light. Less than 5% light decay in 10,000hrs testing. 120° Beam Angle. 900LM Brightness. 50,000h LED. Low heat when in operation. Ultra Light. Unique Wide Angle Design: With 3LEDs setup on both sides of the solar lights which create a wider range of luminosity. Solar Panel IP65 Waterproof Solar Lights: With solar panel, it can convert up to 17% of the sunlight into electricity energy. These LEDs are more durable than conventional glass light bulbs and are more efficient. Hang-up the solar stair lights onto the screws (2pcs) and make sure it is stable. The horizontal distance of these two holes is 76mm. The warm white LED lights illuminate walkways, gardens, and patios. I think it will be your best choice and there's nothing better. Want to decorate your path/garden/yard more pretty and charming?. Buy this!No wiring or electricity is required. Install it indoors or outside, particularly among front porches, laundry rooms, common areas or any application that requires a low-profile, rugged design. Bulkhead Light White. Exterior Lighting Product Type: Bulkhead Lights. 16 LED Solar Power Motion Sensor Garden Yard Security Lamp Wireless Waterproof Outdoor Lighting Lamp 120 Degrees Sensing Angle. Powerful 16 LED Solar Outdoor LED Light whose Life Span is 50,000 hours. Works With: ADT Pulse, Ring, Samsung SmartThings, Wink. When you answer the alert, you can see, hear and speak to people on your property from anywhere. Recording Storage: Cloud. Hear and speak to people with 2-way talk. Gives off very soft light(warm white/white), will lit up your pathway, pond, drive way or be a nice addition to beautify your garden,lawn etc. Due to the top round cover, you can easily keep the water away from the light unit, providing the pathway lamp a better and longer lifespan. Veranda 4 x 4 in. Note that standard 4 in. Perfect for deck, fence and sign projects. Constructed with durable and UV protected plastic housing in white with plastic clear lens. 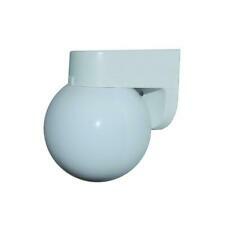 1-Light White Outdoor Incandescent White Wall Bracket with 6 in. Adorn your patio with this attractive outdoor wall bracket fixture. The fixture features UV and corrosion resistant polycarbonate construction. Sunnydaze LED Solar Powered String Lights - White - 100 leads. Create a magical atmosphere in your backyard with this string of bright and beautiful outdoor fairy lights. The LED bulbs are brilliant and energy efficient, and the solar-powered battery lets you enjoy the light without needing to locate a power outlet.